I love finding old cookbooks, hand-me-downs from relatives or books found rummaging through second hand bookshops. Once, I even carted home a box full of old cookbooks waiting for the recycling truck. 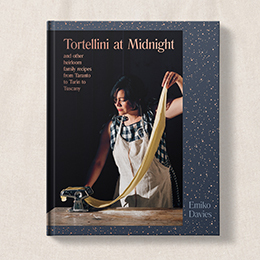 There are treasures in these books, even little ones, like a dog-ear and stained page from that well-used recipe, or – my favourite – a handwritten recipe tucked away in the pages. An old book on Tuscan cooking borrowed from my husband’s aunt had me occupied for weeks before I could decide on a recipe to try. In the end, it all came down to and intriguing recipe with a mysterious ingredient, which I still have not been able to find. Candito nero di popone. Black candied melon. 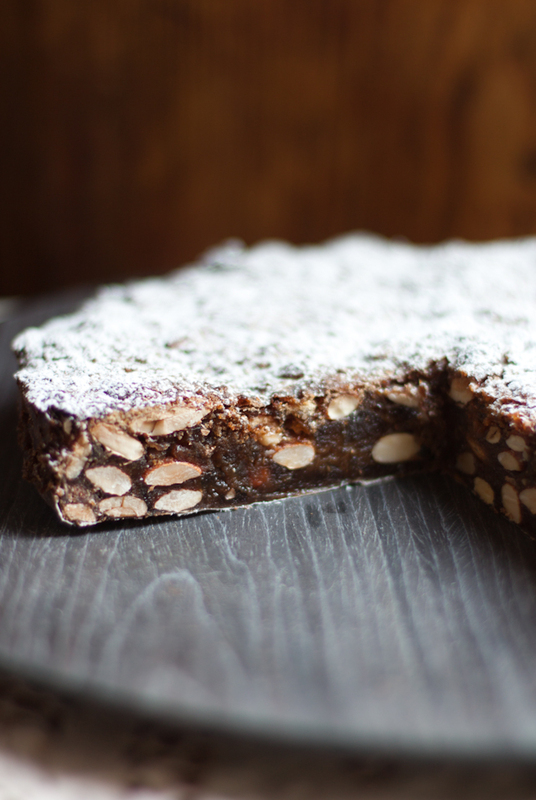 It was a recipe for Sienese panforte, a rich, flat cake with medieval roots, made dense with whole nuts, fistfuls of spices and candied fruit. It literally translates to “strong bread”, alluding to the strong and spicy flavour of this traditional dish, which in the Renaissance was often made with breadcrumbs cooked in honey, spices, dried fruit and nuts. It’s the perfect thing to allow yourself a sliver of in the late afternoon on a cold day when you need a pick me up and a zing of spices to flush your cheeks. It makes a great Christmas treat, both as a beautiful handmade gift and also to serve in a thin wedge at the end of a long meal. It also happens to be one of the easiest cakes in the world to make. But back to the black candied melon. Along with that, the list of spices included something I had honestly never cooked with before, let alone seen in the supermarkets: mace, the curly outer coat of the nutmeg seed. There was only one place that I could think of that would have my panforte ingredients, and more importantly, that would have the best of their kind. It’s a shop in the centre of Florence not far from the Palazzo Vecchio and Dante Alighieri’s neighbourhood, a shop you could not describe in any other way than an apothecary shop. Named after its founder, Dr. Alessandro Bizzarri, who opened its doors in 1842, Bizzarri is a small, dark shop, where all sorts of pots, jars, bottles, acids, liquids, powders and spices are held behind glass cabinets. The role of an apothecary, or speziale, in Florence dates back to the Middle Ages when the Old Market of Florence did a roaring trade in spices. The speziali even had their own guild, one of Florence’s most prestigious, the Arte dei Medici e Speziali, which included physicians, pharmacists and painters. It seems an odd bunch, but it really all comes down to the fact that they all bought their supplies from the same place – the apothecary. 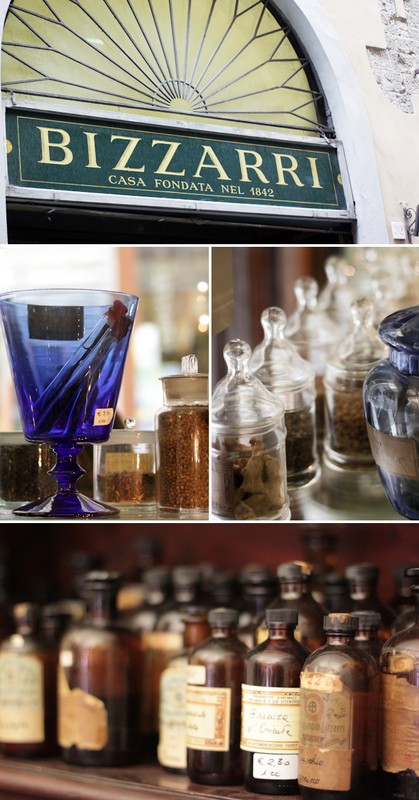 The Bizzarri shop is truly a step back in time and space to the time of apothecaries and potions. Alongside jars of frankincense and products for wine making, you can find beakers and test tubes, handmade Murano glass jars with glass stoppers for your own potions and acids, natural dyes such as Chinese rhubarb, rabbit glue for restoration, sea urchin oil (apparently useful for getting rid of wrinkles), or cobalt blue pigment for fresco painting. But it is also the place for experimental cooks. You can find essential oils of every type, herbs and extracts, as well as ingredients that are impossible to find in Italian supermarkets, such as cream of tartar, pectin, galangal, candied ginger and powdered glucose for creating your own infusions, liqueurs, desserts or baked goods. Their strong point has to be their herbs and spices; you can find anything from elderflower to saffron to the longest cinnamon sticks you have ever seen. When you make your selection, jars are opened, things are scooped out and weighed on vintage scales before being packaged in paper, all on the old, dark wood counter. While you wait patiently for the whole process, you must breathe in deeply. The smells of herbs and spices of this speziale are unlike anything you will experience outside of the Middle Ages. Well, baking this panforte is pretty close. Incidentally, not even Bizzarri could help me on the black candied melon front; they admitted that they had never heard of it. But they did have candied melon, in large, long slices, which was so beautiful and unlike anything I have ever seen or tasted before. It was marshmallow soft and simply melted when baked in the panforte, giving a mellow sweetness. It wasn’t cheap but if you can get your hands on any candied fruit that is homemade or artisan made rather than industrial, it makes all the difference. 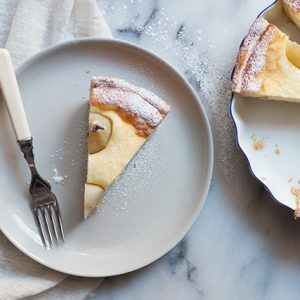 Not having candied melon, you could use candied cedro – there does actually exist a more delicate version of the regular panforte called Panforte Margherita, invented in 1879 for a visit of Queen Margherita of Savoy to Siena. It is made using cedro instead of melon and vanilla instead of the characteristic spices. Traditionally, panforte is cooked on thin, rice paper wafers, but if you cannot get your hands on these specially produced wafers, a cake tin with a removable bottom is just fine. Chop the candied fruit into small pieces and set aside. Grind the mixed spice together (I use a coffee bean grinder that I don’t use for coffee or you can try a mortar and pestle, the old fashioned way) and set aside. Place the sugar in about 100 ml of water in a saucepan over low heat. Let it dissolve and thicken into a syrup without colouring (it should reach 120 C if you have a sugar thermometer). Take the syrup off the heat and combine with the flour, the candied fruit, the whole almonds and spices (minus the cinnamon). Pour into a greased, floured round, flat cake tin (the panforte should be about 2cm tall, a tin about 26cm or 10 inches in diameter should do the trick), sprinkle the cinnamon over the top and cook in a medium oven (about 160 C) for 30 minutes or until firm. Remove the panforte from its cake tin, allow to cool and cover generously with icing sugar. It keeps very well, best if it is covered or in an airtight container in a cool, dark place. Find Bizzarri on your next trip to Florence in Via della Condotta, no. 32red. Closed Sundays and lunch hours. Beautiful! That is a sweet treat I adore. perfect with a scoop of ice cream. Emiko, I love that we both posted about panforte on the same day. Tis the season! I do not love candied fruit (or, more specifically, cedro), but the candied melon you describe sounds really appealing. 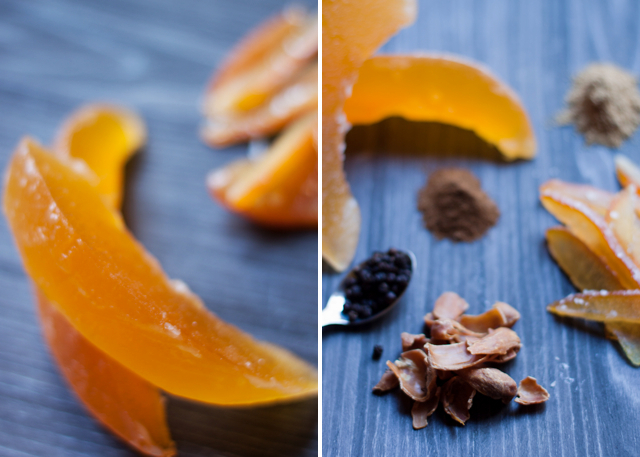 I do like candied orange peel in small doses, so that’s what I used in mine, along with some dried fruits. I enjoyed reading about Bizzarri. Buon natale! 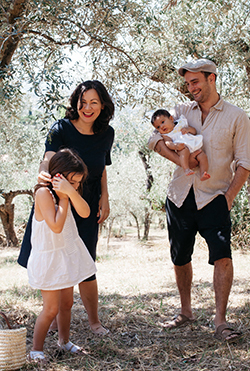 Buon natale to you too! I love old cookbooks as well. Thumbing through them brings the past alive and tells such an interesting story. Beautiful post and cake. I love panforte! But for the real one, come to Siena! And I tell all about its story in the next Foodie Buggle. 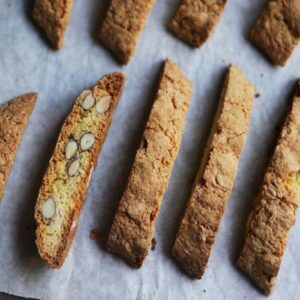 Although Siena is most well known for panforte these days (this recipe is a traditional Sienese recipe), panforte actually doesn’t originally come from Siena. Renaissance documents and recipes for it trace it to the area around Rimini and Emilia-Romagna in general, but also le Marche. Seems the Sienese got hooked on the recipe to keep doing it though! I have an old cookbook from my grandmother. It’s from the 60s I think. I inherited the book. It’s not very useful for me now as I’m vegetarian but I love the little treasures (old handwritten recipes) I always find among the pages. That is a treasure, even if you don’t use it much! I adore things like that! i love those old apothecary bottles!!! Oooh…I just know that I will tremendously enjoy this shop! You can even buy the empty apothecary bottles there – they’re not cheap, but they are all made with murano glass with their own unique glass stoppers. Pretty! Hey Emiko. First, I love you. However, I made this today, and did everything according to the recipe, but upon adding the syrup (which was a lovely syrup in the pot/non crystallized) to the fruit/flour/nut mixture, it instantly seized and the entire thing turned to a huge crystallized mass. I am thinking that the ‘syrup’ does not need to be taken to that thick a consistency before adding to the mixture. Any thoughts are appreciated. I’ve been wanting to make this forever. The thing is, my gut told me not to make it a very thick syrup to begin with, but I went ahead with the instructions anyway. 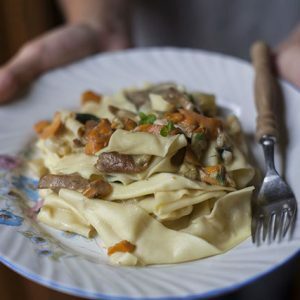 Have you ever had any issues with this recipe? I’m going to compare to a few others to see if/how they differ. THANK YOU! Hi Joni, I’m so sorry to hear this! I have never had this problem and this is todays’ “classic” way to make panforte, but it really sounds like the sugar syrup was cooked too much — this can easily happen and I’ve discovered cooking times/consistency can vary wildly depending on the type of pan you use. So it’s possible that for you the mixture went a bit too far. If you want to try it again, you have two options: you can take the syrup off the heat not too long after you see all the sugar has dissolved or you can use honey in its place. I have not yet tried it with honey but it was once the traditional ingredient in panforte! Have just found this stunning recipe on Pinterest, can’t wait to try it love Panettone, googled you and also started following you on Instagram. Everything looks absolutely delicious and inviting! !